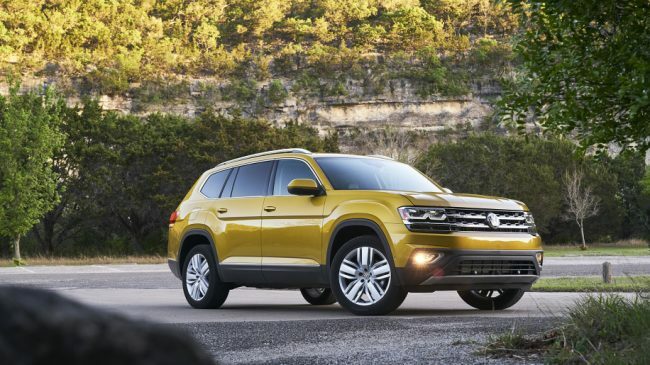 For the 2018 model year, Volkswagen’s build site for the Atlas offers 15 standard configurations – 4 with the 2.0-liter turbocharged four-cylinder, the remaining 11 with the 3.6-liter V6. Prices start at $31,745 after destination for the front-wheel drive 2.0 S, and go up to $49,735 for the AWD V6 SEL Premium. Currently, you can’t get an AWD Atlas until you step up to the V6 S at $34,945. For next year, the 2.0-liter trims drop from four to one: the 2.0 S, which will start at $31,890 after destination, a $145 increase. Eliminating the other three 2.0L configurations wouldn’t seem to be a big deal, since buyers had to order them from the factory. After that, according to CarsDirect‘s perusal of the order guide, it looks like VW has made an unusual choice. The eleven varieties of V6 trim shrink, losing the FWD V6 S model. Right now there’s a V6 Launch Edition with front-wheel drive, if that goes away then buyers must make a $3,200 leap from the 2.0L to the next available trim, the V6 S with AWD at $35,090. That V6 S price also includes a $145 increase. If you want a FWD Atlas with the V6, you need to step up again to the V6 SE, which will run $36,490, reflecting a $255 price increase over the 2018 model. So in 2019, instead of being able to buy a FWD V6 Atlas for $1,800 less than an AWD model, it will cost $1,400 more to buy a FWD Atlas. Assuming the numbers are correct, the FWD V6 Atlas will be more expensive than competitor crossovers like the Toyota Highlander LE, Honda Pilot, and Ford Explorer with the same drivertain. Buyers considering the 2.0L will likely want to pull triggers this year: CarsDirect says the entire lineup offers a $1,000 bonus, and the turbocharged 2.0L models get up to $1,500 in unadvertised dealer incentives.